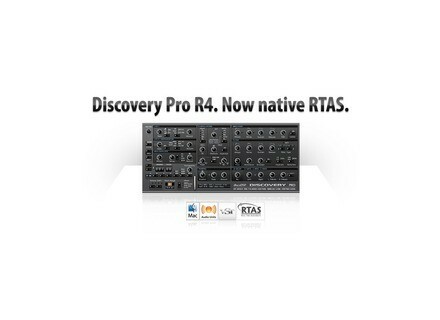 Discovery Pro R4, Virtual hybrid synth from DiscoDSP. discoDSP has announced the release of Discovery Pro R4 for Mac OS X and Windows, which includes the release of the first RTAS versions. Zone presets. Each section can save individual presets based on the current state. It's available by clicking the white small drop down menu icon located at the top left corner. Gate values are now displayed at the LCD when mouse is over. Mac DMG image now includes alias to Audio Units, VST, RTAS and Plug-Ins folders for a easier installation. Apple GarageBand 09 and Logic 09 compatibility. All previous Discovery Pro R1 Mac and Discovery Pro R3 Windows users will get this update for free by logging at members area. Native Instruments Komplete 6 Native Instruments has announced Komplete 6, the latest version of its software bundle. Sony Creative Software Sound Forge Pro 10 Sony Creative Software has announced the availability of the Sound Forge Pro 10 digital audio production suite. Steinberg CI2 Steinberg announced the CI2 Advanced Integration USB Studio offering both recording and controller features with the included Cubase AI 5 and Advanced Integration technology to offer a production solution for newcomers and mobile production environments.